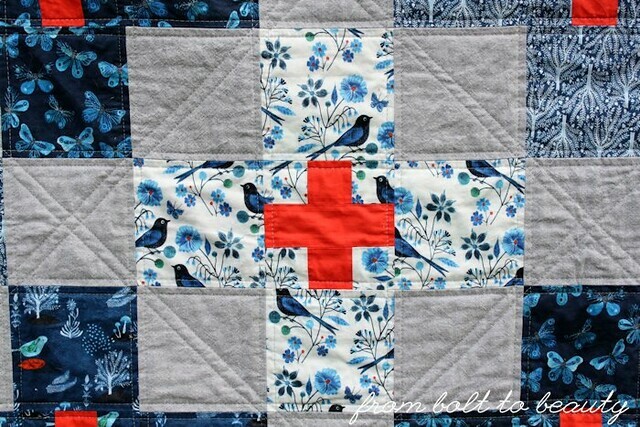 It drives me batty when another quilter, somewhere on social media, posts an unrecognizable corner of a project because he or she is doing some secret sewing and cannot reveal any more. (It’s not nice to tease!) Likewise, it’s hard when I’m the one doing the secret sewing. I often use Instagram in particular to bounce ideas off of other sewers. Doing so is not an option, however, when the future recipient keeps tabs on my projects via social media. My quilty BFF, award-winning quilter Kim Soper, had a very special birthday this month. I couldn’t pass up the opportunity to do some—alas!—secret sewing for her. Two years ago, I bought her five half-yards of Geninne’s Moody Blues from Cloud 9. 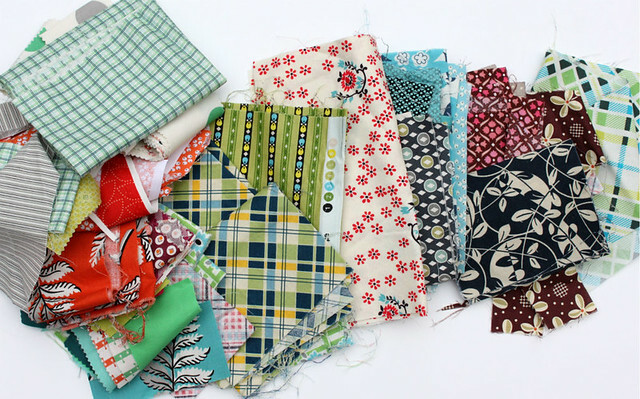 (This line is now out of print, but you can see all the fabrics and an accompanying free quilt pattern on the Cloud 9 site.) 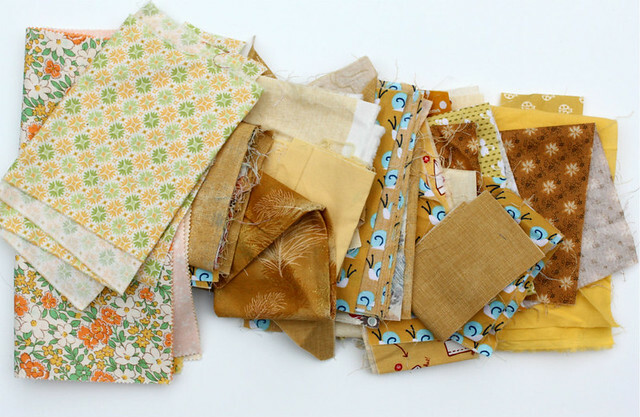 Kim is crazy about Geninne’s bird illustrations, and I intended to gift the fabric to her as a bundle. At the time, though, she had just moved into a new house and still had a little one with her during the day. 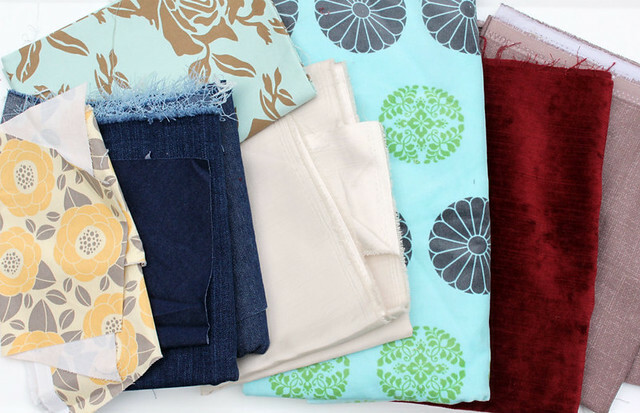 I decided that a gift of fabric would have saddled her with yet another project she didn’t have time to do. The hardest part of this project—aside from keeping it a secret!—was working with the limited palette. At one point over the summer, I had to put this quilt to the side to work on higher-priority projects. When I returned to it, I flipped out a little bit. 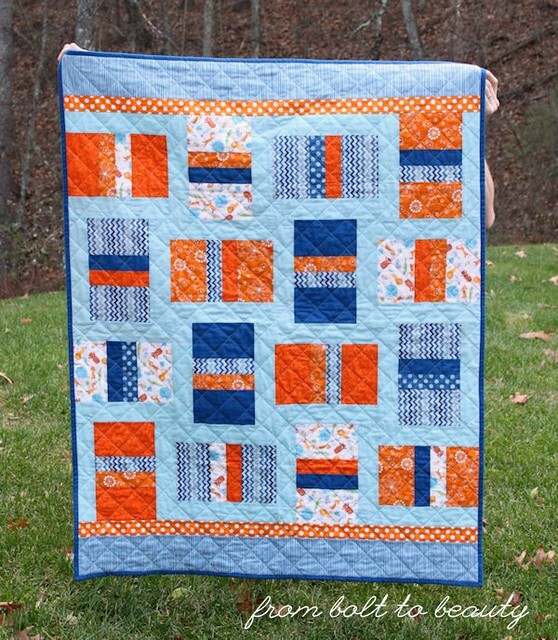 When did I decide to make Kim an orange and blue quilt?! But I didn’t. 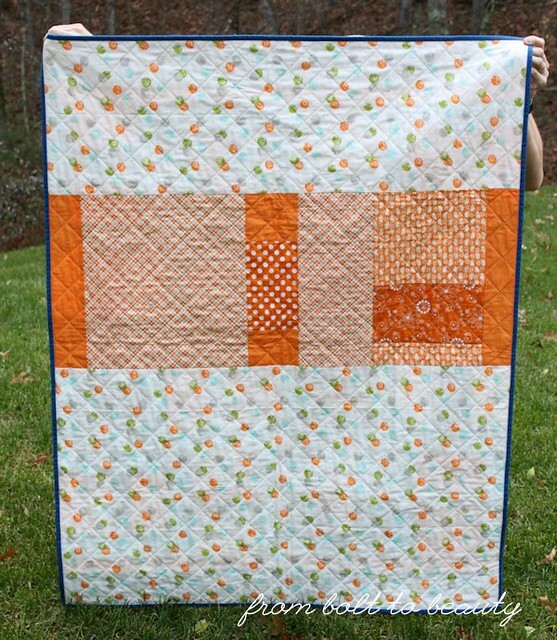 I decided to make her a Moody Blues quilt, and in addition to the copious amount of blue in the collection, there is some high-contrast orange, which is how I decided to use Cotton Couture in clementine for the inner plus signs and why I went with the Essex Linen in steel for the background (I think the gray tones down the contrast of the complementary colors). 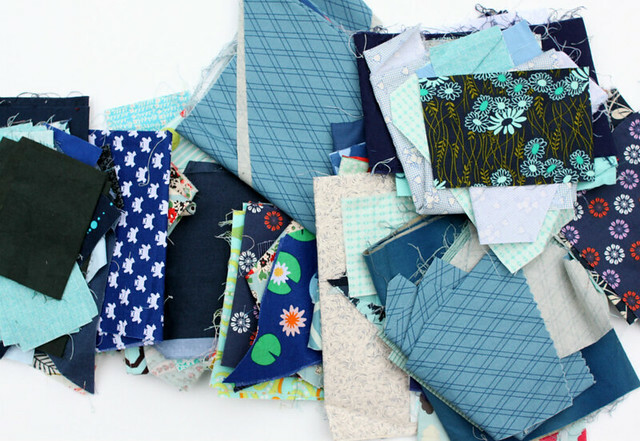 There is also some teal in the Moody Blues fabrics, but it appears sparingly. (See the picture, above.) So I gave teal its own spotlight on the back of the quilt. 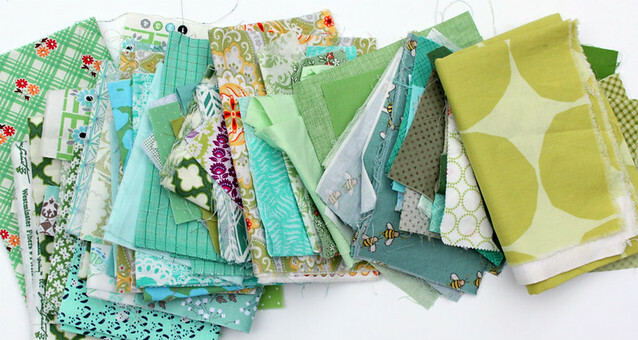 I’m thrilled with the Anna Maria Horner floral print, Lizzy House pearls, and chunks of teal in the piecing there. 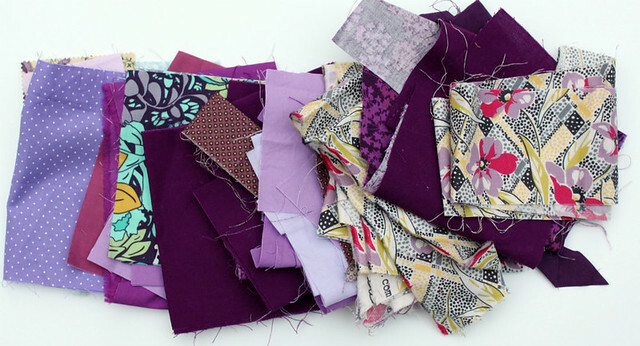 What’s your take on secret sewing? Let us all know in the comments. Last month, I went to Cape Cod with my guild for a weekend of sewing and socializing. It was crazy fun and went all too fast, but I was pleased with my accomplishments for the weekend: I wrapped up three quilt tops! I have friends who work on a project from start to finish at retreats. That isn’t appealing to me. Even at home, I need multiple projects at different stages of being sewn and quilted to keep things interesting. To me, a retreat is more like a sweatshop than a creativity fest—I want to get things done!—so I aim to maintain a good level of productivity. I choreographed my work for the weekend like this: I had all three quilt tops planned out in advance, with all the necessary fabric selected and cut before my trip. 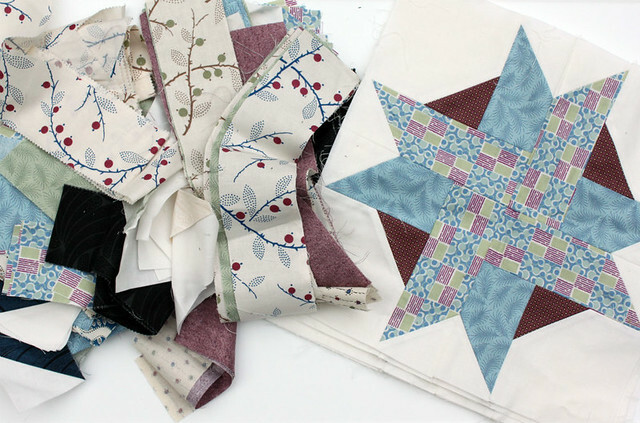 For two of these projects I sewed blocks, too—it was easier to nail down the layout at home instead of on retreat, where design boards are in short supply. 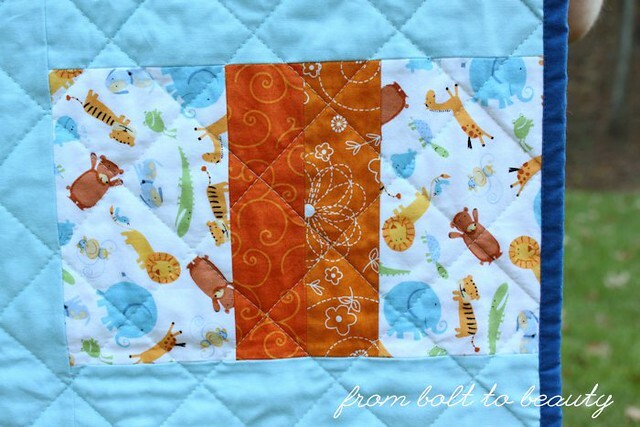 The first project I tackled on the Cape was an easy blue and orange baby quilt. I finished the top the first day at the retreat, and that quick success propelled me into project #2: another Christmas tree quilt. 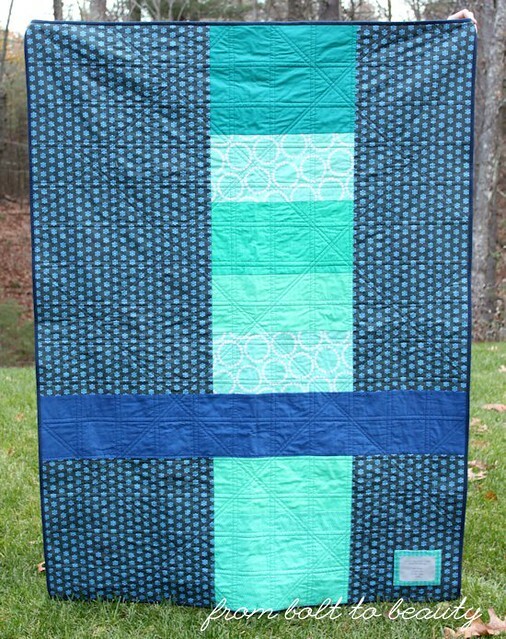 My final project was that same baby quilt pattern in subdued colors. 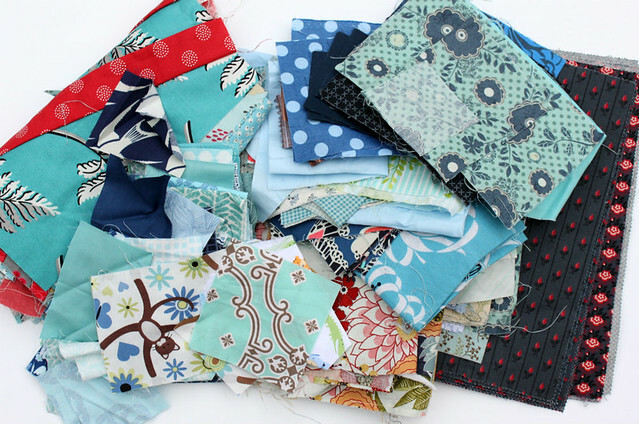 Fabrics: This fabric pull was easy to assemble—a fat quarter or less of each print was all that the pattern required. I had a little bit of the animal print in my scraps. 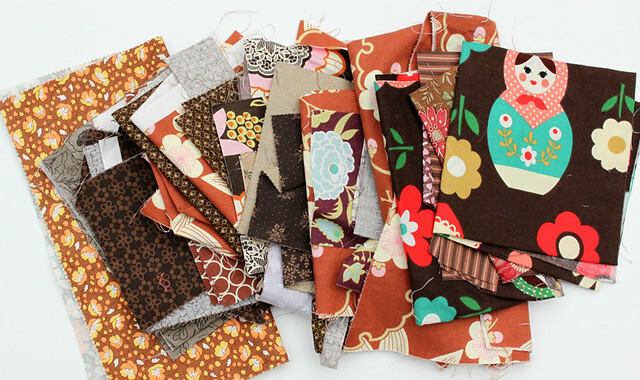 The other fabrics are from a Maywood Studios bundle of Dawn KimberBell basics that my husband bought for me. The background is Kona Lake. The backing features a low-volume print from Bonnie and Camille’s Happy Go Lucky line. 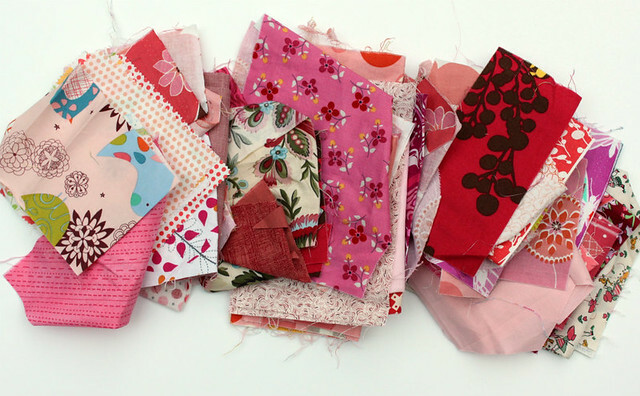 All the fabrics I used were from my stash! How does the next month look for you? Will you be making up to the last minute? 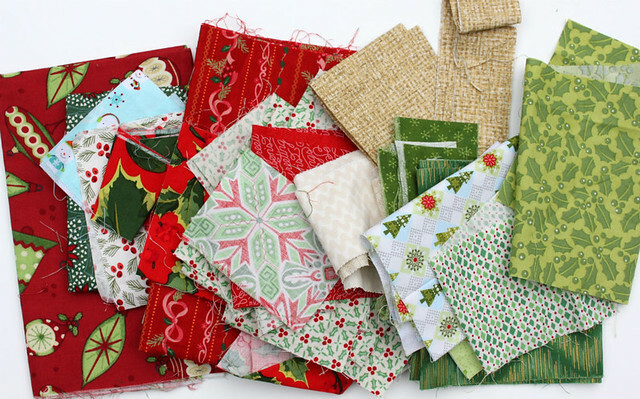 Will it be sewing and quilting all month long, or are there other holiday crafts you enjoy? I used to make my own Christmas cards. Hahahaha—that will never happen again! November is the busiest month of the year for me. It always includes a visit from my family over Thanksgiving, a visit from my husband’s parents before they head south for the winter, and my older son’s birthday. 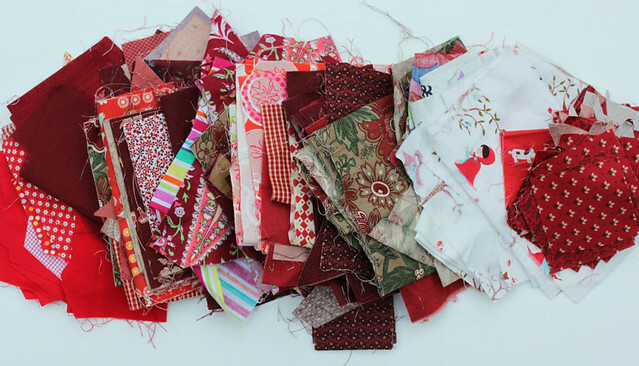 Then there’s the submission deadline for QuiltCon on November 30. 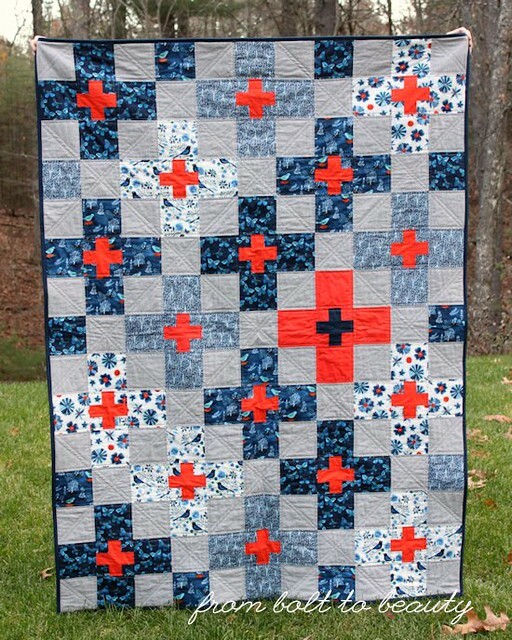 I want to submit at least one quilt this year—right now I have zero finished! To claim your lot(s), add a comment below. Important: If you’re a no-response blogger, you’ll need to provide an email address in that comment. I’ll follow up via email to figure out PayPal payment and your shipping address. Lot 2: RedsClaimed by Kathy E.
Lot 9: Neutrals/low volumesClaimed by Ann O. Lot 10: ChristmasClaimed by Kathy E.
Lot 11: Denyse Schmidt (both big-box lines and quilt-shop collections)Claimed by Beth P.
Lot 12: Downton Abbey (this includes five finished blocks and scraps from this quilt) Claimed by Melody A.